I keep forgetting to get up a post for this, so it's been a while since I participated, sorry Misty! And since we recently had to reformat our laptop I don't have any pictures except for old ones in my photobucket account. So here is a picture from a few years ago at the zoo. 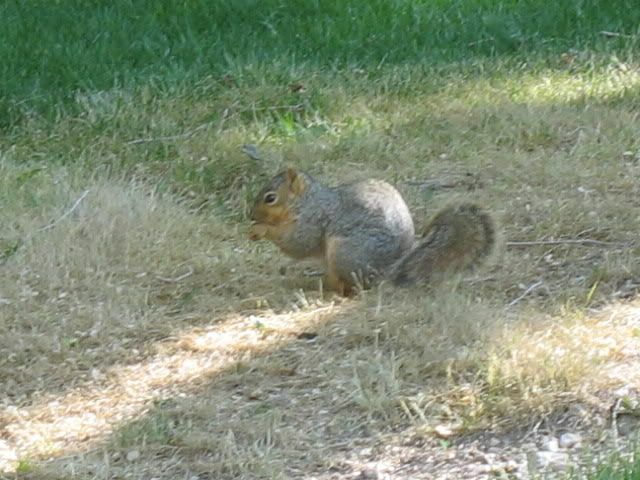 Yes, at the zoo I took a picture of your average squirrel. Why? Because I think they are cute :D Plus the kids like to see squirrels. And of course in a small town zoo a squirrel is just as exotic as most of the other animals they have lol. Check out Camera Critters to see some more pics of animals every week. I just love to see chheky squirrels. We don't get the here. i think they are cute too! I never seem squirrels in my city. I only saw squirrels once thi year, on the mountain. Years ago, I had already found there were very few dogs in my town,I guess most of them were eaten. Our people eat almost anything.